In my previous post, I mentioned being frustrated with the deteriorating weather as I sat around my apartment waiting for the time to pass. I watched the entire two hour National Geographic Bee, had some coffee, and played with my phone. Although it was still cloudy (about 60% coverage) when I went out to the Intramural Fields at 3:30am, there was a hole in the clouds directly overhead. It was my lucky break, and I set up my tripod facing northeast at about 60 degrees elevation. Using two stars of the Summer Triangle as guides, I knew the SpaceX Dragon C2+ capsule would "thread the needle" between Deneb and Vega (according to the StarWalk app). Anticipated path for Dragon C2+ flyover. 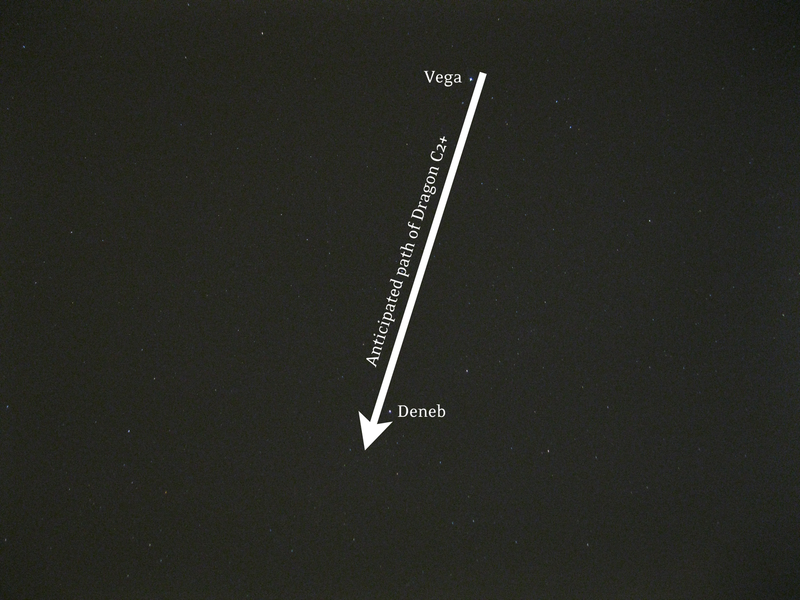 "Threading the needle" between Vega and Deneb. 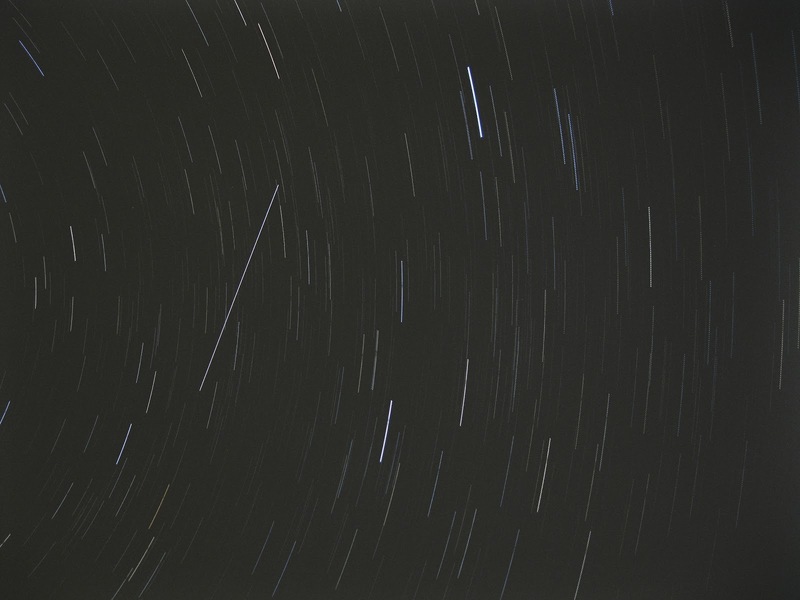 Unfortunately, at ISO 400 and 15 sec exposure, Dragon was not visible in any of my frames. However, when I saw the ISS rise above the clouds at about 30 degrees elevation, I forgot all about Dragon. This was my first ISS observation, and it blew me away. It instantly became the brightest object in the sky, and shot almost directly overhead. It was like an unblinking aircraft flying impossibly high and impossibly fast. What really blew my mind was that my Satellite Tracker app had perfectly predicted the flyover. 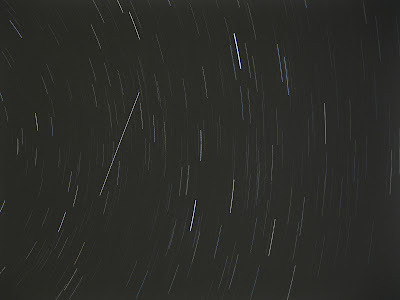 I can imagine being out at night with friends and pretending to produce a shooting star on demand with careful timing. "If there is a god, send us a sign!!" - queue ISS flyover. Update: Based on the C2+ mission updates, it looks like I didn't "miss" Dragon on my camera because Dragon wasn't there! I was expecting the capsule to be about 2 minutes in front of the ISS, and I figured Dragon would do another lap around the planet and catch up to the ISS again. 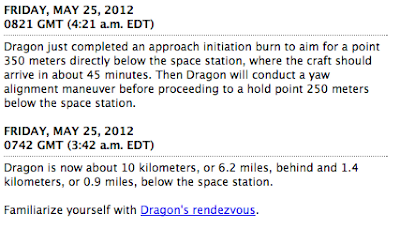 Well, I must have misunderstood the rendezvous maneuvers, because it looks like at around 4am EST there is no way Dragon could have been flying 2 minutes in front of the ISS because it was easily within 10 kilometers of the station. It might be a false memory, but I might recall seeing a small amber light trailing immediately behind the ISS. Who knows - either way there is no way to discern between the ISS and Dragon in my 15 sec exposures because they're all blurred together.